That’s 101.8°F, one of the hottest verified days on record, second only to a series of unconfirmed spikes in June of 2013. For reference, the first Penguin update clocked in at 93.1°. Unfortunately, trying to determine how the algorithm changed from looking at individual keywords (even thousands of them) is more art than science, and even the art is more often Ms. Johnson’s Kindergarten class than Picasso. Sometimes, though, we catch a break and spot something. 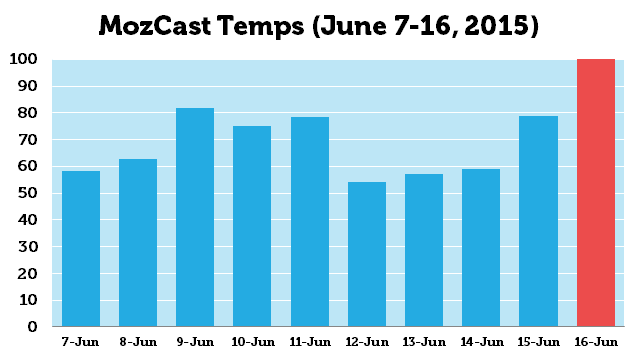 When you watch enough SERPs, you start to realize that change is normal. So, the trick is to find the queries that changed a lot on the day in question but are historically quiet. Looking at a few of these, I noticed some apparent shake-ups in HTTP vs. HTTPS (secure) URLs. So, the question becomes: are these anecdotes, or do they represent a pattern? 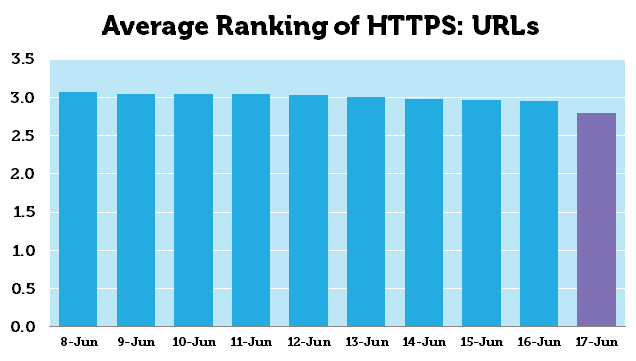 HTTPS URLs also seem to have gotten a rankings boost – dropping (with “dropping” being a positive thing) from an average of 2.96 to 2.79 in the space of 24 hours. Seems pretty convincing, right? Here’s the problem: rankings don’t just change because Google changes the algorithm. We are, collectively, changing the web every minute of the day. Often, those changes are just background noise (and there’s a lot of noise), but sometimes a giant awakens. Anecdotally, I noticed that some Wikipedia URLs seemed to be flipping from HTTP to HTTPS. I ran a quick count, and this wasn’t just a fluke. It turns out that Wikipedia started switching their entire site to HTTPS around June 12 (hat tip to Jan Dunlop). This change is expected to take a couple of weeks. It’s just one site, though, right? Well, historically, this one site is the #1 largest land-holder across the SERP real-estate we track, with over 5% of the total page-1 URLs in our tracking data (5.19% as of June 17). Wikipedia is a giant, and its movements can shake the entire web. So, how do we tease this apart? If Wikipedia’s URLs had simply flipped from HTTP to HTTPS, we should see a pretty standard pattern of shake-up. Those URLs would look to have changed, but the SERPS around them would be quiet. So, I ran an analysis of what the temperature would’ve been if we ignored the protocol (treating HTTP/HTTPS as the same). While slightly lower, that temperature was still a scorching 96.6°F. Is it possible that Wikipedia moving to HTTPS also made the site eligible for a rankings boost from previous algorithm updates, thus disrupting page 1 without any code changes on Google’s end? Yes, it is possible – even a relatively small rankings boost for Wikipedia from the original HTTPS algorithm update could have a broad impact. So far, Google has only said that this was not a Panda update. 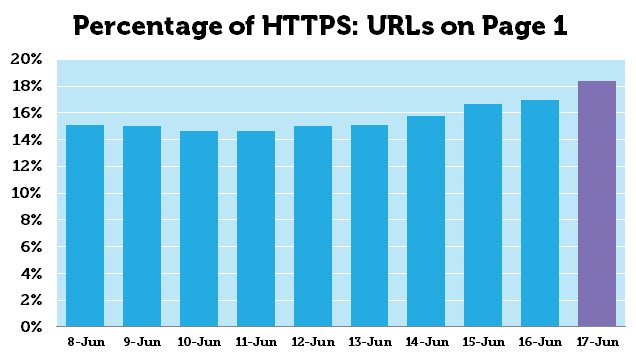 There have been rumors that the HTTPS update would get a boost, as recently as SMX Advanced earlier this month, but no timeline was given for when that might happen. Is it possible that Wikipedia’s publicly announced switch finally gave Google the confidence to boost the HTTPS signal? Again, yes, it’s possible, but we can only speculate at this point. My gut feeling is that this was more than just a waking giant, even as powerful of a SERP force as Wikipedia has become. We should know more as their HTTPS roll-out continues and their index settles down. In the meantime, I think we can expect Google to become increasingly serious about HTTPS, even if what we saw yesterday turns out not to have been an algorithm update. In the meantime, I’m going to melodramatically name this “The Colossus Update” because, well, it sounds cool. If this indeed was an algorithm update, I’m sure Google would prefer something sensible, like “HTTPS Update 2” or “Securageddon” (sorry, Gary). No comment on other updates, or the potential impact of a Wikipedia change. I feel strongly that there is an HTTPS connection in the data, but as I said – that doesn’t necessarily mean the algorithm changed.